Natural disasters are the scariest thing ever—not Michael Myers, roller coasters, or even spiders. Earth Under Water is a 2010 documentary by National Geographic that explores the ever-rising sea levels threatening to drown out civilizations. The closest I’ve been to a natural disaster was in Toronto, 2010, when my family and I missed a tornado by a mere 20 minutes. We watched the news as all the ceilings of stores we had just been at were ripped off entirely. The sky was jet-black that day. However, natural disasters occur every day. We as British Columbians face the constant threat of annihilation with the looming inevitability of the “Big One”—a megathrust earthquake and ensuing tsunami long overdue to hit Canada’s West Coast. That is, if we’re not underwater already. Antarctica holds vast amounts of frozen water, locked up in ice. If melted, this ice would dramatically raise sea levels—and the melting has already started. Scientists have calculated that Antarctica holds about 90 percent of the ice on Earth. Together with Greenland, that is enough ice, if melted, to cause the global sea levels to rise by 70 metres. Manhattan, Berlin, Paris, and of course Richmond are just a few cities that would find themselves underwater. 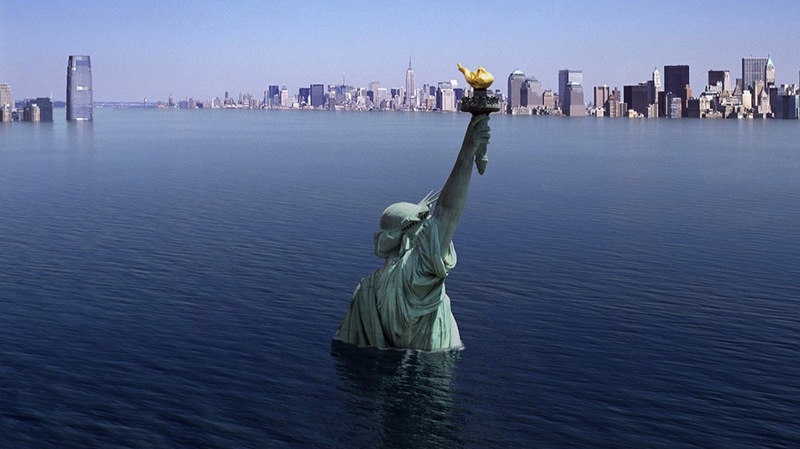 Water rising is not a myth; it could happen again, just as it’s happened before. During Earth’s most recent ice age, which only ended about 12,000 years ago, ice sheets expanded so that land mass grew as sea levels fell. However, as the Earth grew ever warmer, sea levels climbed as the ice receded and eventually became the levels we have on Earth today. Due to the large amount of fossil fuel consumption, global temperatures are rising again. 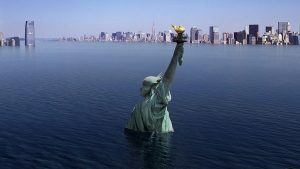 Predicting exactly how much the sea levels are going to rise is difficult because humanity has never had the technology to produce mass carbon dioxide before. Like any National Geographic documentary, Earth Under Water is filled to the brim with scenic shots, including beautiful drone views of Antarctica and cities that may not exist in the next 100 years. CGI incorporated into the film enhances many of these city shots with added flooding, allowing you to see what many of the Earth’s coastal cities will look like once sea levels have risen enough. The documentary also shows possible sea defences that can be implemented to protect our civilizations. Some defences are already being put in place, such as a large structure in the ocean to protect New Orleans from further flooding. CGI even illustrates the potential for floating cities in the ocean. Acknowledging there’s a problem is the start to finding a solution. Next is educating yourself on the problem, and National Geographic is a great step in that journey. Earth Under Water is a terrifying documentary of a far too real threat posed by global warming. Despite ignorance being bliss, climate change can’t be ignored forever—or humanity will suffer the consequences.